Background: Plumbago indica Linn. and its active constituent, plumbagin, are conventionally used in Thai alternative medicines, but information regarding their effects on cytochrome P450 (CYP450) enzymes is limited. Objective: To establish the effects of P. indica Linn. and plumbagin on CYP450 profiles. Materials and Methods: Adult male mice were orally administered P. indica extract (20, 200, and 1000 mg/kg/day) or plumbagin (1, 5, and 15 mg/kg/day) for 14 days. The levels of hepatic CYP450 mRNA and protein were assessed using reverse transcription/real-time polymerase chain reaction and immunoblotting, respectively, and specific enzyme reactions were performed to determine the enzyme activities. Results: Expression of Cyp1a2 was induced by both P. indica and plumbagin, while P. indica, but not plumbagin, slightly suppressed Cyp2c29 expression. Expression of Cyp2d9 was suppressed by both P. indica and plumbagin. Expression of Cyp2e1 was unchanged, but P. indica at the lowest dose increased Cyp2e1 activity. P. indica and plumbagin dose-dependently suppressed the expression of Cyp3a11/13 and its activity. Conclusions: Modulation of CYP450 profiles by P. indica and plumbagin is a concern as there are risks of drug–herb interaction. Abbreviations used: CYP450: Cytochrome P450; BSA: Bovine serum albumin; GAPDH; Glyceraldehyde 3-phosphate dehydrogenase. Modulation of cytochrome P450 profiles, induction of Cyp1a2 and Cyp2e1, while suppression of Cyp2d9 and Cyp3a11/13, by Plumbago indica and plumbagin are the concerns as there are risks of hepatotoxicity and drug–herb interaction, especially a use at high quantity or for a long period. To date, the use of herbal plants as alternative medicine has become increasingly common worldwide.,, Recent evidence showed that herbal supplements have been regularly consumed by approximately 20% of the population, leading to increased awareness in herb–drug interactions which can result in undesired adverse effects. Herb–drug interactions occur through several mechanisms. However, the most common mechanism involves modulation of pharmacokinetics of a concomitant drug by an herb,, which is an inducer/inhibitor of cytochrome P450 (CYP450), a major superfamily of hepatic metabolizing enzymes that biotransformed over 90% of clinical drugs.,, Induction of the CYP450 enzymes results in an increase in metabolism and thus excretion of its substrate, while the inhibition leads to a decrease in excretion of the substrate and as a result prolongs elimination time. Plumbago indica Linn. (family Plumbaginaceae), a shrub widely distributed in tropical and subtropical regions of Africa, Australia, and Asia, contains plumbagin (5-hydroxy-2-methyl-1,4-naphthoquinone), a yellowish quinonoid, as a major constituent that contributes to the medicinal properties., The P. indica root has been used as an active ingredient in Ayurveda for diarrhea, indigestion, and several skin diseases and has been applied as an anthelmintic, appetite stimulant, and rubefacient agent.,, The root of P. indica, the part mostly contained in the medicinal remedies, yields the highest amount of plumbagin (0.17% w/w) among Plumbago species. P. indica extract possessed antibacterial,, and antifungal activities. Plumbago species have been claimed for antifertility property. Particularly, P. indica was employed in ancient remedies for abortion. Plumbagin possessed biological activities similar to P. indica extracts, i.e., anthelmintic, antimalarial, antibacterial, antifungal, anti-inflammatory,, antidiabetic, immunosuppressive, and anticancer activities,,,, and abortifacient. Despite their biological values and current uses, information regarding the effects of P. indica and plumbagin on CYP450s is still limited. To pursue the U.S. Food and Drug Administration recommendation to predict the CYP450-associated herb–drug interactions, this study aimed to examine how P. indica extract and plumbagin influence the expressions of Cyp1a2, Cyp2c29, Cyp2e1, and Cyp3a11/ 13 in the mouse livers. The observations revealed that the P. indica extract and plumbagin potentially modified the CYP450 profiles at molecular levels, namely mRNA and protein expression, including enzyme activities, subsequently leading to a risk of herb–drug interaction. Therefore, the concomitant use of a product containing P. indica or plumbagin with modern medication is of concern to justify the potential benefit and risk. Plumbagin was a product of LKT Laboratories (St. Paul, MN, USA). Acrylamide/bis-acrylamide 30% (29:1) was obtained from Bio-Rad (Hercules, CA, USA). Erythromycin, β-nicotinamide adenine dinucleotide phosphate reduced form (NADPH), bovine serum albumin (BSA), β-mercaptoethanol, p-nitrocatechol, and Tris base were supplied by Sigma-Aldrich Chemical (St. Louis, MO, USA). ReverTra Ace® was a product of Toyobo Co., Ltd. (Osaka, Japan). Taq DNA polymerase was purchased from Vivantis® (Malaysia). All other laboratory chemicals were of the highest purity from commercial suppliers. The root of P. indica was bought from Mor Tong-In Thai Traditional Medicine (Mahasarakham, Thailand) in June 2014. The plant materials were identified by Dr. Waraporn Putalun, Faculty of Pharmaceutical Sciences, Khon Kaen University (Khon Kaen, Thailand), and the reference specimen (PANPB-PI 2014-002) was deposited at the Herbarium of the Faculty of Pharmaceutical Sciences, Khon Kaen University. It was dried at 50°C in an oven and then shredded and extracted with methanol using a Soxhlet apparatus for 3 h before evaporated and freeze-dried into powder. %Yield of the extract was 33.40% by weight. Plumbagin content was analyzed on a Hypersil® ODS column (5 μm, 250 mm × 4.0 mm, Agilent Technologies, CA, USA) with an isocratic linear solvent system of 50% (v/v) acetonitrile at a flow rate of 1 mL/min using an Agilent 1260 Infinity high-performance liquid chromatography (HPLC) system (Agilent Technologies) coupled with a UV-Vis detector. The chromatogram was monitored at the wavelength of 410 nm and analyzed with the ChemStation software (Agilent Technologies). Identification and quantification of plumbagin were performed based on retention time and peak area with the plumbagin authentic standard. Seven-week-old male ICR mice were obtained from the National Laboratory Animal Center, Mahidol University (Nakorn Pathom, Thailand). All mice were housed in an animal unit of Faculty of Pharmaceutical Sciences, Khon Kaen University. The animal handling and treatment protocol was approved by the Animal Ethics Committee for Use and Care of Khon Kaen University (Approval No. AEKKU11/2558). Mice were housed in polysulfone cages with wood-shaved bedding (5 per cage) under a controlled temperature (23°C ± 2°C) and humidity (45% ± 2%) with a 12-h dark/light cycle. Water and commercial rodent diet were supplied ad libitum. The mice (n = 5) were orally administered the P. indica extract (20, 100, and 1000 mg/kg/day) or plumbagin (1, 5, and 15 mg/kg/day) daily for 14 days. The control group was orally given the vehicle 0.5% carboxy methyl cellulose daily for the same period. At 24 h after the last treatments, the livers were collected and kept at −80°C for further analysis. Guanidine thiocyanate-phenol-chloroform method was employed to prepare total RNA from the livers. Total RNA was reversed transcribed to cDNA using ReverTra Ace® at 25°C for 10 min, 42°C for 60 min, and 95°C for 5 min, respectively. The reaction mixture for real-time polymerase chain reaction (PCR) contained 50 ng cDNA, 0.25 mM of each forward and reverse primers [Table 1], 1 mM dNTP mixture, 2 mM MgCl2, 1× SYBR green I, and 1.25 unit of Taq DNA polymerase. Each PCR cycle was initiated at 95°C for 30 s, before lowering to the annealing temperature of each gene for 30 s, followed by the extension temperature at 72°C for 30 s. The mRNA levels were normalized to that of glyceraldehyde 3-phosphate dehydrogenase (Gapdh), a reference gene which was not affected by the treatments. Liver microsome was prepared as described previously. In brief, the liver was homogenized in 1.15% KCl before centrifuged at 10,000 g for 10 min at 4°C, and then, the supernatant was subjected for ultracentrifugation at 104,000 g for 60 min at 4°C. The microsome pellet was reconstituted with ice-cold water and kept at −80°C before using. The protein content was determined by the method of Bradford using BSA as the standard. The expressions of CYP450 proteins were determined using sodium dodecyl sulfate-polyacrylamide gel electrophoresis (SDS-PAGE) coupled with immunoblotting, with some modifications. Briefly, each microsome sample (10 μg) was resolved on a 12% SDS-PAGE before transferred to a Hybond-C nitrocellulose membrane. The specific CYP450 proteins was detected using polyclonal antibody against Cyp1a2 (Daiichi #299124), Cyp2c9 (Abcam #ab4236), Cyp2d9 (Santa Cruz #sc-23690), or Cyp3a11/ 13 (Daiichi #299223). Gapdh was employed as the reference gene and detected using polyclonal anti-Gapdh immunoglobulin G (IgG) (Abcam #EPR16891/ab181602). Then, the immunoblots were incubated with biotinylated anti-IgG, and the antigen-antibody complex was visualized using the 3,3'-diaminobenzidine peroxidase substrate kit. Production of p-nitrocatechol from p-nitrophenol hydroxylation was assessed for Cyp2e1 activity with some modifications. Briefly, a reaction mixture of 150 μg microsomes, 1 mM ascorbic acid, 500 μM p-nitrophenol, 10 mM NADPH, and 0.1 M phosphate buffered saline (pH 7.0), in a total volume of 145 mL, was incubated at 37°C for 20 min before adding 0.6 N HClO4. Then, the mixture was centrifuged at 1900 rpm for 15 min. The supernatant was collected and mixed with 10 N NaOH. The absorbance was measured at a wavelength of 490 nm compared with the p-nitrocatechol standard. Formaldehyde formation from erythromycin N-demethylation in the Hantzsch reaction was performed to assess CYP3A activity with some modifications. Briefly, the reaction mixture of 1 mM NADPH, 15 mM MgC12, 1 mM erythromycin, 70 mM phosphate buffer (pH 7.4), and 15 mg microsomes, in a final volume of 100 mL, was incubated with NADPH to initiate the reaction at 37°C for 20 min. And then, the reaction was stopped by adding 12.5% trichloroacetic acid before centrifuged at 1900 rpm for 15 min. The supernatant was collected and mixed with the Nash reagent before incubated at 60°C for 15 min. The absorbance was measured at a wavelength of 405 nm compared with the formaldehyde standard. The data were analyzed using one-way ANOVA followed by the least significant difference post hoc test (IBM SPSS statistics version 19, Armonk, New York, United States). P < 0.05 was considered statistically significant. 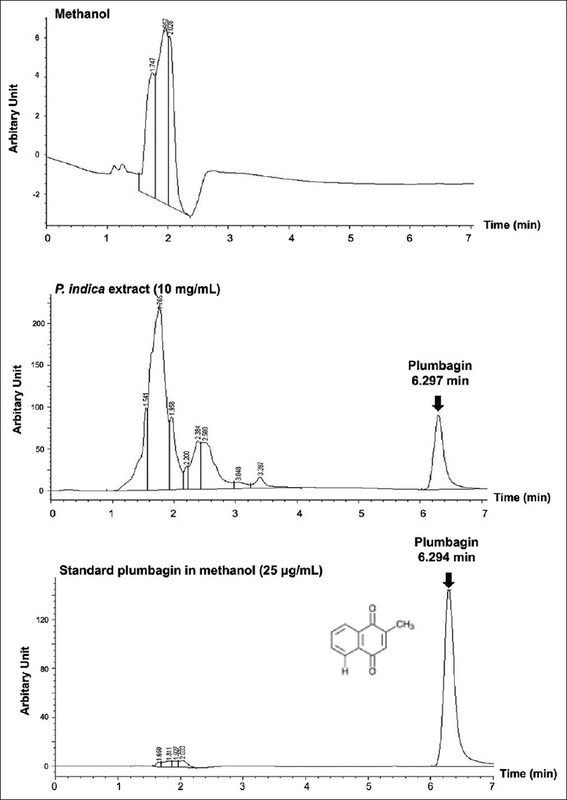 The P. indica extract was quantitatively determined plumbagin content by the HPLC method. The chromatograms of the P. indica extract and standard plumbagin are shown in [Figure 1]. The retention time of plumbagin was about 6.3 min. The content of plumbagin in the extract was 0.15 ± 0.003%. The expression of Cyp1a2 mRNA was significantly elevated by both P. indica and plumbagin [Figure 2]a. Correspondingly, the expression of CYP1A2 protein was persistently upregulated after the treatments of P. indica and plumbagin [Figure 2]b. By contrast, plumbagin did not significantly change the expression level of Cyp2c29 mRNA [Figure 2]a while the P. indica extract at the two higher doses (200 and 1000 mg/kg/day) slightly suppressed those of Cyp2c29 mRNA. The expression of CYP2C29 protein was correlated with those of Cyp2c29 mRNA, in which the expression levels of CYP2C29 protein were significantly declined by the two higher doses of P. indica extract while the others were remained unchanged [Figure 2]b. The pattern of Cyp2d9 mRNA expression tended to be dose-dependently suppressed [Figure 2]a, whereas the expression of CYP2D9 protein was significantly downregulated by both of the P. indica extract and plumbagin [Figure 2]b. The expressions of Cyp2e1 mRNA [Figure 2]a and p-nitrophenol hydroxylase responsible CYP2E1 activity [Figure 2]c were not significantly modified by either the P. indica extract or plumbagin, except the lowest dose of P. indica extract with a significant increase in the CYP2E1 activity. 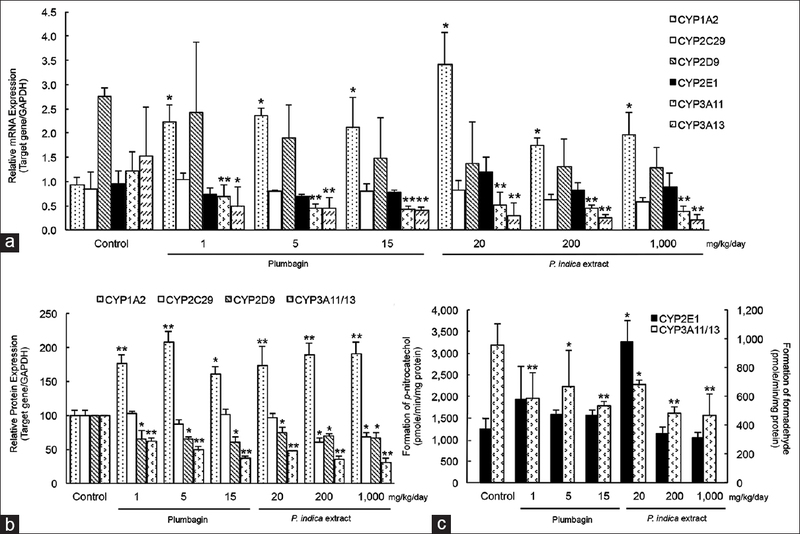 The expressions of Cyp3a11 and Cyp3a13 mRNAs were extensively suppressed in a dose-dependent pattern by both of the P. indica extract and plumbagin [Figure 2]a, in accordance with the expression of CYP3A11/13 protein [Figure 2]b. Likewise, both the P. indica extract and plumbagin significantly inhibited the erythromycin N-demethylase responsible CYP3A activity [Figure 2]c.
The plumbagin content in the P. indica extract was presently found at 0.15% ± 0.003% dry weight which well correlated with its content in the chloroform extract at 0.17% and the ethanol extract at 0.20%. A small variation of the plumbagin content among these reports might occur from cultivation of the plant and season of harvesting, including storage procedure, and the extraction method. While herbal supplements are popularly consumed, the incidence of herb–drug interactions is increasingly reported spontaneously. The most common mechanism responsible for drug interactions involves pharmacokinetic modulation of the concomitant drug via the modification of drug metabolizing enzymes profiles, especially CYP450s., The examples of CYP450 modulatory herbs were St. John's Wort, a potent inducer of CYP3A4, CYP2E1, and CYP2C19; grapefruit juice and black pepper, a potent CYP3A4 inhibitor;, and Ginkgo biloba and pomegranate juice, an inhibitor of CYP3A4., In the current study, we evaluated how P. indica and plumbagin affect the profiles of CYP450s, including Cyp1a2, Cyp2c29, Cyp2d9, Cyp2e1, and Cyp3a11/ 13, in the mouse livers. CYP1A consists of CYP1A1 and CYP1A2. CYP1A2 is one of the major CYP450s in human (~13%–15%) highly abundant in the liver and responsible for metabolism and elimination of exogenous substances, clinically important drugs, such as clozapine, tacrine, tizanidine, and theophylline, some procarcinogens such as benzo[a] pyrene and aflatoxin B1, and several important endogenous compounds, including steroids and arachidonic acids. P. indica and plumbagin significantly elevated the expression levels of Cyp1a2 mRNA and protein in mice. The induction mechanism of Cyp1a associated with heterodimerization of a cytosolic receptor, aryl hydrocarbon receptor (AhR), and AhR nuclear translocator along with upstream-enhancer elements which transmitted the induction signal to the promoter, resulting in the transcription and translation processes. Despite the increasing levels of Cyp1a2 mRNA and protein, neither the P. indica extract nor plumbagin exhibited the significant changes in the methoxyresorufin O-demethylase responsible CYP1A2 activity (data not shown). These evidences noted that the increases in either Cyp1a2 mRNA or protein were probably not enough to convey physiological effects. On the other hand, an in vitro study showed inhibitory effect of plumbagin on CYP1A2 activity in human microsomes. These findings might be due to the differences in the assessment and limitation of the method, in which our study was an in vivo animal model while Sumsakul et al. employed human microsomes, an in vitro model. In addition, it should be noted that an in vitro study could not demonstrate an inductive effect of CYP450. CYP2C is a subfamily responsible for metabolism of 16% clinical drugs, e.g., (S)-mephenytoin, omeprazole, tricyclic antidepressants, proguanil, warfarin, non-steroidal antiinflammatory drugs (NSAIDs), tolbutamide, nelfinavir, paclitaxel, and carisoprodol, and mostly found in the liver, followed by heart, and cardiac tissue., Human CYP2C comprises CYP2C8, CYP2C9, CYP2C18, and CYP2C19, while mouse Cyp2c exists as much as 15 isoforms. A study in amino acid sequence alignment showed that human CYP2C9 was homologous to both mouse Cyp2c29 and mouse Cyp2c55. In this study, though P. indica and plumbagin did not significantly suppress the expression of Cyp2c29 mRNA, the two higher doses of the P. indica extract showed the inhibitory effect on the expression of CYP2C29 protein. Correspondingly, a previous study showed that plumbagin inhibited human CYP2C19 activity at 35 folds greater than the selective inhibitor, nootkatone. CYP2D is classified as a noninducible isoform by xenobiotics. CYP2D metabolizes 20%–50% clinical drugs. Substrates of CYP2D are basic lipophilic nitrogen-containing molecules and alkaloids. Although drug interactions due to CYP2D activation do not normally happen, epigenetic variations of CYP2D enzymes and inhibition of CYP2D enzyme activity can be occurred., Of nine Cyp2d isoforms in mouse, Cyp2d9 showed high amino acid identity to CYP2D6, a major human CYP2D. In this study, the expressions of Cyp2d9 mRNA and protein were dose-dependently inhibited by both of the P. indica extract and plumbagin. These observations suggested that plumbagin and/or other constituents in the extract were metabolized by CYP2D9 and consequently resulted in a decrease in the Cyp2d9 expression. Therefore, use of a product containing P. indica or plumbagin concomitant with a CYP2D substrate, i.e., neuroactive drugs such as tricyclic antidepressants, e.g., imipramine, amitriptyline, clomipramine, and desipramine, and selective serotonin reuptake inhibitors, e.g., fluoxetine and sertraline, may cause unwanted effects due to slower rate of metabolism and thus excretion of these drugs. CYP2E1 is a major CYP450 isoform that causes hepatic oxidative injury.,, Human CYP2E1 has been similar to mouse, rat, and rabbit Cyp2e1, making an in vivo study of CYP2E1 activity in an animal model reliably predicts the CYP2E1 activity in human., CYP2E1 is responsible for catalyzing metabolism and bioactivation of low-molecular-weight molecules, i.e., procarcinogens, and drugs, and metabolism of endogenous fatty acids and ketones. CYP2E1 is inducible via posttranscription and posttranslation pathways of protein stabilization and inhibition of ubiquitin-mediated protein degradation., Stabilization of mRNA and protein facilitated the transcription process,, while inhibition of the ubiquitin-mediated protein degradation inhibited the ubiquitin-dependent proteasomal degradation system and enhancing posttranslational protein. During the process of xenobiotic metabolisms by CYP2E1, oxygen-free radicals were produced as by-products. Hence, induction of Cyp2e1 might result in hepatic oxidative injury via production of oxygen-free radicals., In this study, the expression levels of Cyp2e1 mRNA and its activity were not significantly modified by either the P. indica extract or plumbagin, except an increase in activity by the P. indica extract at the lowest dose of 20 mg/kg/day. These evidences might be explained by the induction of Cyp2e1 at the posttranscriptional levels, without a significant increase in the gene content, as Cyp2e1 is inducible by a variety of small molecules. This, though through an unknown mechanism, is similar to the effects of St. John's Wort extract on CYP2E1 activity in human hepatocytes where lower doses showed induction while higher doses did inhibition. On the other word, the inductive effect on CYP2E1 activity was not caused by plumbagin as plumbagin did not contribute to the same effect, but produced by other constituents in the P. indica extract, possibly the ones also found in St. John's wort. CYP3A takes part as 30% of the CYP450 content in the liver and responsible for metabolism of 50% clinical drugs, e.g., glucocorticoid and antiglucocorticoid hormones, macrolides, imidazole, phenobarbital, and phenobarbital-like agents.,, CYP3A has low substrate specificity, meaning to be able to bind with substrates of various sizes, shapes, and chemical properties and subsequently to metabolize a variety of substrates including drugs, chemicals, and food constituents, such as polyphenols, commonly found in fruits and vegetables. These make developing a new drug necessary to evaluate the metabolism pathway via CYP3A4 to predict a risk of drug interaction. Mouse CYP3A11 and CYP3A13 were the most similar to human CYP3A4, with 72 and 75% amino acid homology, respectively. In the present study, the P. indica extract and plumbagin significantly suppressed the expression levels of Cyp3a11 and Cyp3a13 mRNAs and proteins in a dose-dependent pattern. In addition, both of the P. indica extract and plumbagin dose-dependently declined the CYP3A activity via inhibition of the erythromycin N-demethylation. Correspondingly, plumbagin moderately inhibited CYP3A4 activity in human liver microsomes. Therefore, the evidence of inhibitory effects of P. indica and plumbagin on Cyp3a11 and Cyp3a13 should be concern since it may cause potential herb–drug interactions due to a wide variety of CYP3A substrates. These possible potential interaction outcomes due to CYP3A inhibition are such as ventricular arrhythmia associated with QT prolongation by astemizole or cisapride, symptomatic hypotension by dihydropyridine calcium antagonists or sildenafil, and excessive sedation of benzodiazepine or nonbenzodiazepine hypnosedatives. Thus, administration of the P. indica extracts or plumbagin concomitantly with these drugs should be of high concerns. CYP450s-modulatory capacities of the P. indica extract and plumbagin were herewith reported. In brief, Cyp1a2 and Cyp2e1 were induced while Cyp2d9 and Cyp3a11/ 13 were suppressed with Cyp2c29 being remained unchanged. Since P. indica is listed in the Thai national herbal formula and probably consumed with modern medicine, a potential risk of drug–herb interaction might occur. Therefore, a practitioner should be cautious of use of either P. indica or plumbagin-containing supplement, especially at high quantity or for a long period, for hepatotoxicity and drug interaction. Nadta Sukkasem sincerely thanks the Research Group for Pharmaceutical Activities of Natural Products using Pharmaceutical Biotechnology, Faculty of Pharmaceutical Sciences, Khon Kaen University, Thailand, for scholarship and research grant and facilities. Dr. Glenn Borlace is acknowledged for critical English editing. The study was supported by the Research Group for Pharmaceutical Activities of Natural Products using Pharmaceutical Biotechnology, Khon Kaen University, Khon Kaen 40002 Thailand. Zhou S, Gao Y, Jiang W, Huang M, Xu A, Paxton JW, et al. Interactions of herbs with cytochrome P450. Drug Metab Rev 2003;35:35-98. Foti RS, Wahlstrom JL. The role of dietary supplements in cytochrome P450-mediated drug interactions. Bol Latinoam Caribe Plant Med Aromat 2008;7:66-84. Wanwimolruk S, Phopin K, Prachayasittikul V. Cytochrome P450 enzyme mediated herbal drug interactions (Part 2). EXCLI J 2014;13:869-96. Wu CH, Wang CC, Tsai MT, Huang WT, Kennedy J. Trend and pattern of herb and supplement use in the United States: Results from the 2002, 2007, and 2012 National Health Interview Surveys. Evid Based Complement Alternat Med 2014;2014:872320. Hasler JA, Estabrook R, Murray M, Pikuleva I, Waterman M, Capdevila J, et al. Human cytochromes P450. Mol Aspects Med 1999;20:1-37. Zangar RC, Davydov DR, Verma S. Mechanisms that regulate production of reactive oxygen species by cytochrome P450. Toxicol Appl Pharmacol 2004;199:316-31. Izzo AA. Interactions between herbs and conventional drugs: Overview of the clinical data. Med Princ Pract 2012;21:404-28. Padhye S, Dandawate P, Yusufi M, Ahmad A, Sarkar FH. Perspectives on medicinal properties of plumbagin and its analogs. Med Res Rev 2012;32:1131-58. Lorsuwannarat N, Saowakon N, Ramasoota P, Wanichanon C, Sobhon P. The anthelmintic effect of plumbagin on Schistosoma mansoni. Exp Parasitol 2013;133:18-27. Dutt UC. The Materia Medica of the Hundus: Compiled from Sanskrit Medical Works. Calcutta: Thacker, Spink and Co.; 1877. Ariyanathan S, Saraswathy A, Rajamanickam GV. Quality control standards for the roots of three Plumbago species. Indian J Pharm Sci 2010;72:86-91. Paul AS, Islam A, Yuvaraj P. Anti-helicobacter pylori and cytotoxic activity of detoxified root of Plumbago auriculata, Plumbago indica and Plumbago zeylanica. J Phytopharmacol 2013;2:4-8. Kaewbumrung S, Panichayupakaranant P. Antibacterial activity of plumbagin derivative-rich Plumbago indica root extracts and chemical stability. Nat Prod Res 2014;28:835-7. Saha D, Paul S. Antibacterial activity of Plumbago indica. Turk J Pharm Sci 2014;11:217-22. Saha D, Paul S. Cytotoxic activity of methanolic extract of Plumbago indica L. (Family: Plumbaginaceae). Asian J Pharm Tech 2012;2:59-61. Sheeja E, Joshi SB, Jain DC. Antiovulatory and estrogenic activity of Plumbago rosea leaves in female albino rats. Indian J Pharmacol 2009;41:273-7. Lorsuwannarat N, Piedrafita D, Chantree P, Sansri V, Songkoomkrong S, Bantuchai S, et al. The in vitro anthelmintic effects of plumbagin on newly excysted and 4-weeks-old juvenile parasites of Fasciola gigantica. Exp Parasitol 2014;136:5-13. Sumsakul W, Plengsuriyakarn T, Chaijaroenkul W, Viyanant V, Karbwang J, Na-Bangchang K. Antimalarial activity of plumbagin in vitro and in animal models. BMC Complement Altern Med 2014;14:15. Kuete V, Tangmouo JG, Meyer JJ, Lall N. Diospyrone, crassiflorone and plumbagin: Three antimycobacterial and antigonorrhoeal naphthoquinones from two Diospyros spp. Int J Antimicrob Agents 2009;34:322-5. Wang T, Wu F, Jin Z, Zhai Z, Wang Y, Tu B, et al. Plumbagin inhibits LPS-induced inflammation through the inactivation of the nuclear factor-kappa B and mitogen activated protein kinase signaling pathways in RAW 264.7 cells. Food Chem Toxicol 2014;64:177-83. Zhang J, Onakpoya IJ, Posadzki P, Eddouks M. The safety of herbal medicine: From prejudice to evidence. Evid Based Complement Alternat Med 2015;2015:316706. Sunil C, Duraipandiyan V, Agastian P, Ignacimuthu S. Antidiabetic effect of plumbagin isolated from Plumbago zeylanica L. root and its effect on GLUT4 translocation in streptozotocin-induced diabetic rats. Food Chem Toxicol 2012;50:4356-63. McKallip RJ, Lombard C, Sun J, Ramakrishnan R. Plumbagin-induced apoptosis in lymphocytes is mediated through increased reactive oxygen species production, upregulation of Fas, and activation of the caspase cascade. Toxicol Appl Pharmacol 2010;247:41-52. Wang H, Tompkins LM. CYP2B6: New insights into a historically overlooked cytochrome P450 isozyme. Curr Drug Metab 2008;9:598-610. Xu KH, Lu DP. Plumbagin induces ROS-mediated apoptosis in human promyelocytic leukemia cells in vivo. Leuk Res 2010;34:658-65. Lai L, Liu J, Zhai D, Lin Q, He L, Dong Y, et al. Plumbagin inhibits tumour angiogenesis and tumour growth through the Ras signalling pathway following activation of the VEGF receptor-2. Br J Pharmacol 2012;165:1084-96. Sukkasem N, Chatuphonprasert W, Tatiya-Aphiradee N, Jarukamjorn K. Imbalance of the antioxidative system by plumbagin and Plumbago indica L. extract induces hepatotoxicity in mice. J Intercult Ethnopharmacol 2016;5:137-45. Jearapong N, Chatuphonprasert W, Jarukamjorn K. Effect of tetrahydrocurcumin on the profiles of drug-metabolizing enzymes induced by a high fat and high fructose diet in mice. Chem Biol Interact 2015;239:67-75. Chatuphonprasert W, Jarukamjorn K, Putalun W. Regulation of cancer-related genes-Cyp1a1, Cyp1b1, Cyp19, Nqo1 and Comt-expression in β-naphthoflavone-treated mice by miroestrol. J Pharm Pharmacol 2016;68:475-84. Belmont-Díaz J, López-Gordillo AP, Molina Garduño E, Serrano-García L, Coballase-Urrutia E, Cárdenas-Rodríguez N, et al. Micronuclei in bone marrow and liver in relation to hepatic metabolism and antioxidant response due to coexposure to chloroform, dichloromethane, and toluene in the rat model. Biomed Res Int 2014;2014:425070. Chatuphonprasert W, Jarukamjorn K. Impact of six fruits – Banana, guava, mangosteen, pineapple, ripe mango and ripe papaya – On murine hepatic cytochrome P450 activities. J Appl Toxicol 2012;32:994-1001. Unnikrishnan KP, Raja SS, Balachandran I. A reverse phase HPLC-UV and HPTLC methods for determination of plumbagin in Plumbago indica and Plumbago zeylanica. Indian J Pharm Sci 2008;70:844-7. Wadhwa S, Singhal S, Rawat S. Bioavailability enhancement by piperine: A review. Asian J Biomed Pharm Sci 2014;4:1-8. Adukondalu D, Shravan Kumar Y, Vamshi Vishnu Y, Shiva Kumar R, Madhusudan Rao Y. Effect of pomegranate juice pre-treatment on the transport of carbamazepine across rat intestine. Daru 2010;18:254-9. Lau AJ, Yang G, Rajaraman G, Baucom CC, Chang TK. Species-dependent and receptor-selective action of bilobalide on the function of constitutive androstane receptor and pregnane X receptor. Drug Metab Dispos 2012;40:178-86. Martignoni M, Groothuis GM, de Kanter R. Species differences between mouse, rat, dog, monkey and human CYP-mediated drug metabolism, inhibition and induction. Expert Opin Drug Metab Toxicol 2006;2:875-94. Zhou SF, Yang LP, Zhou ZW, Liu YH, Chan E. Insights into the substrate specificity, inhibitors, regulation, and polymorphisms and the clinical impact of human cytochrome P450 1A2. AAPS J 2009;11:481-94. Sumsakul W, Chaijaroenkul W, Na-Bangchang K. In vitro inhibitory effects of plumbagin, the promising antimalarial candidate, on human cytochrome P450 enzymes. Asian Pac J Trop Med 2015;8:914-8. Flachsbart F, Ufer M, Kleindorp R, Nikolaus S, Schreiber S, Nebel A, et al. Genetic variation in the CYP2C monooxygenase enzyme subfamily shows no association with longevity in a German population. J Gerontol A Biol Sci Med Sci 2011;66:1186-91. Nelson DR, Zeldin DC, Hoffman SM, Maltais LJ, Wain HM, Nebert DW. Comparison of cytochrome P450 (CYP) genes from the mouse and human genomes, including nomenclature recommendations for genes, pseudogenes and alternative-splice variants. Pharmacogenetics 2004;14:1-8. Chang Q, Berdyshev E, Cao D, Bogaard JD, White JJ, Chen S, et al. Cytochrome P450 2C epoxygenases mediate photochemical stress-induced death of photoreceptors. J Biol Chem 2014;289:8337-52. Lee SS, Cha EY, Jung HJ, Shon JH, Kim EY, Yeo CW, et al. Genetic polymorphism of hepatocyte nuclear factor-4alpha influences human cytochrome P450 2D6 activity. Hepatology 2008;48:635-45. Ingelman-Sundberg M. Genetic polymorphisms of cytochrome P450 2D6 (CYP2D6): Clinical consequences, evolutionary aspects and functional diversity. Pharmacogenomics J 2005;5:6-13. Dickmann LJ, Tay S, Senn TD, Zhang H, Visone A, Unadkat JD, et al. Changes in maternal liver cyp2c and cyp2d expression and activity during rat pregnancy. Biochem Pharmacol 2008;75:1677-87. Daniel WA, Haduch A, Wójcikowski J. Inhibition and possible induction of rat CYP2D after short- and long-term treatment with antidepressants. J Pharm Pharmacol 2002;54:1545-52. Wu D, Cederbaum AI. Oxidative stress mediated toxicity exerted by ethanol-inducible CYP2E1. Toxicol Appl Pharmacol 2005;207:70-6. Lu Y, Cederbaum AI. CYP2E1 and oxidative liver injury by alcohol. Free Radic Biol Med 2008;44:723-38. Cederbaum AI. Role of CYP2E1 in ethanol-induced oxidant stress, fatty liver and hepatotoxicity. Dig Dis 2010;28:802-11. Freeman JE, Stirling D, Russell AL, Wolf CR. CDNA sequence, deduced amino acid sequence, predicted gene structure and chemical regulation of mouse Cyp2e1. Biochem J 1992;281(Pt 3):689-95. Cui JY, Renaud HJ, Klaassen CD. Ontogeny of novel cytochrome P450 gene isoforms during postnatal liver maturation in mice. Drug Metab Dispos 2012;40:1226-37. Woodcroft KJ, Hafner MS, Novak RF. Insulin signaling in the transcriptional and posttranscriptional regulation of CYP2E1 expression. Hepatology 2002;35:263-73. Costas I. Cytochromes P450: Role in the Metabolism and Toxicity of Drugs and Other Xenobiotics (Issues in Toxicology). Cambridge: RSC Publishing; 2008. Bogacz A, Karasiewicz M, Kujawski R, Bartkowiak-Wieczorek J, Cichocka J, Kowalska A, et al. Molecular mechanisms of regulation of CYP enzymes of phase I metabolism of xenobiotics-synthetic drugs and herbal preparations. Herba Pol 2012;58:46-59. Tompkins LM, Wallace AD. Mechanisms of cytochrome P450 induction. J Biochem Mol Toxicol 2007;21:176-81. Hellum BH, Hu Z, Nilsen OG. Trade herbal products and induction of CYP2C19 and CYP2E1 in cultured human hepatocytes. Basic Clin Pharmacol Toxicol 2009;105:58-63. Quattrochi LC, Guzelian PS. Cyp3A regulation: From pharmacology to nuclear receptors. Drug Metab Dispos 2001;29:615-22. Wang D, Sadee W. The making of a CYP3A biomarker panel for guiding drug therapy. J Pers Med 2012;2:175-91. Basheer L, Kerem Z. Interactions between CYP3A4 and dietary polyphenols. Oxid Med Cell Longev 2015;2015:854015. Woodland C, Huang TT, Gryz E, Bendayan R, Fawcett JP. Expression, activity and regulation of CYP3A in human and rodent brain. Drug Metab Rev 2008;40:149-68. Zhou S, Chan E, Li X, Huang M. Clinical outcomes and management of mechanism-based inhibition of cytochrome P450 3A4. Ther Clin Risk Manag 2005;1:3-13.